White Corn Grits are simply plain white corn that has been ground until it has the consistency of coarse sand. It is used as a side dish, as a breakfast cereal or as an ingredient in baked goods. I used quick grits , which is very healthy. This became one of our healthy breakfast. Mix grits with the liquids and microwave for 5 minutes stirring every two minutes, or on stove top until cooked. Then add butter and cheese to it. Now scramble eggs in the pan with some salt and pepper. 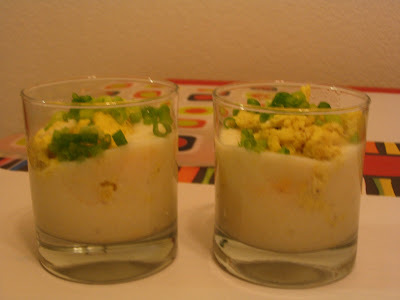 In a bowl or glass pour some silky smooth grits top with eggs and garnish with spring onions.